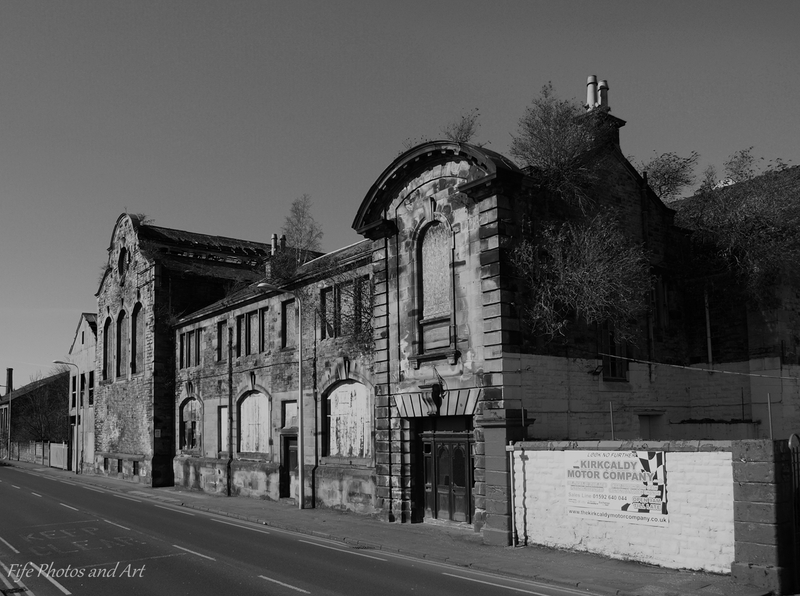 Continuing from my previous post (Black & White Photos From Pathhead, Kirkcaldy – Part 1), here are a few more photos taken in Kirkcaldy, going along Victoria Rd, and then down Dunnikier Road towards the harbour. The first three photos show an old warehouse or factory (possibly the old Dunnikier Linoleum Works, built some time after 1895) on Victoria Rd. The fourth photo shows St Marie’s RC church (now part of “The Polish Province of the Society of the Divine Saviour) built c1900 by John Bennie Wilson(?). The church was originally a Free Church, built in a tudor gothic style, with a tower and a squat spire. 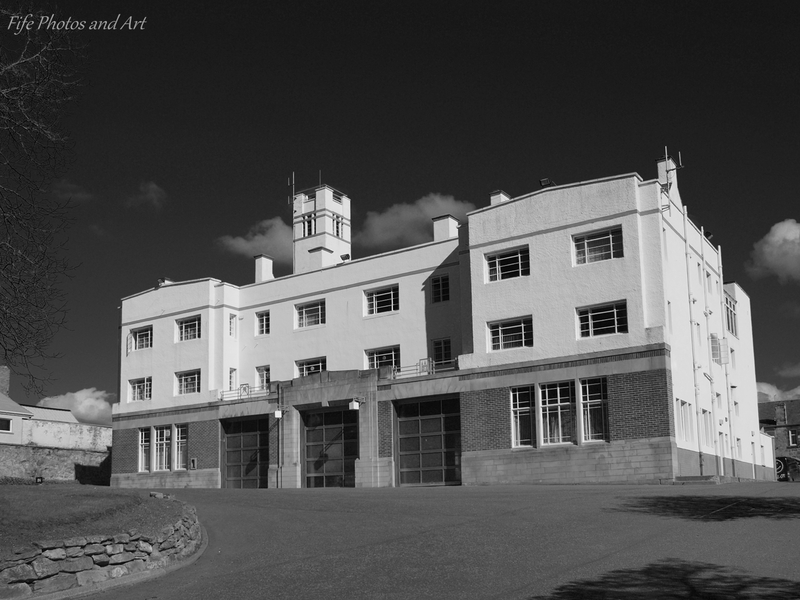 The final photo is of Kirkcaldy Fire Station, built in 1938, as a modern 3 storey ferro concrete framed purpose built fire station, with a tall square fire practice tower in the NE. This building is fairly typical of the Art Deco style that was popular in the 1930s. 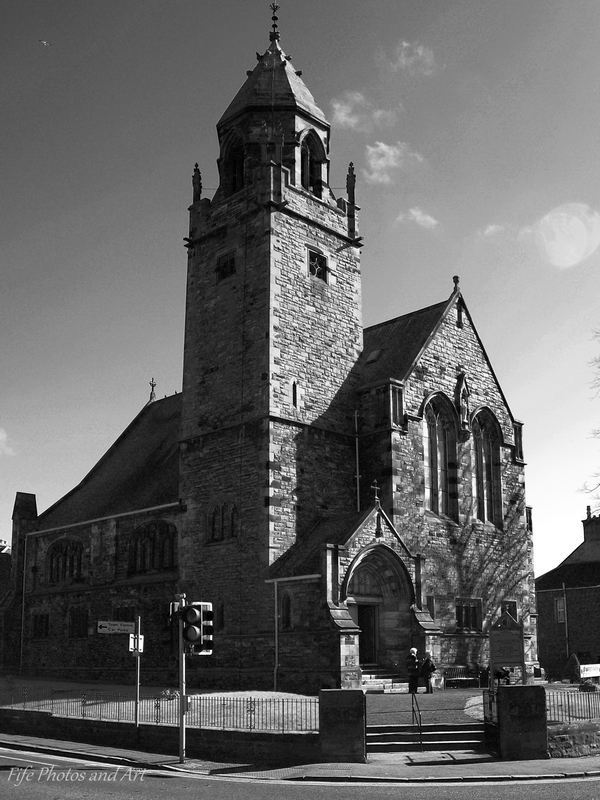 This entry was posted in Architecture, Fine Art Photography, History and tagged architecture, black & white photography, churches, Kirkcaldy, photography, Scotland, Scottish history. Bookmark the permalink. 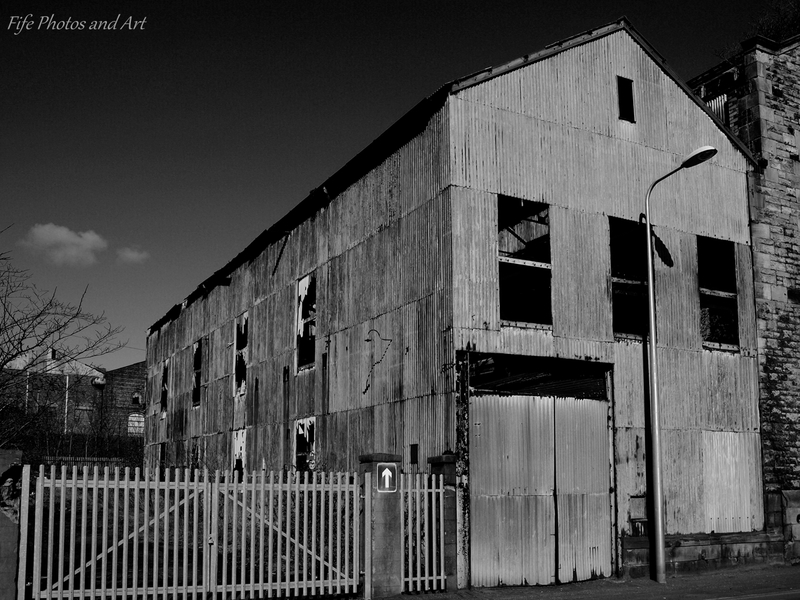 As usual, I love your pictures but the most arresting for me are those of the old warehouse in Victoria Street …. the texture like rotting corrogated cardboard is absolutely fabulous. Fascinating places with stories to tell. Whenever I read the name Kirkcaldy, I have to say it in my head, I love the way it sounds – crazy G aren’t I? Always gorgeous pictures 🙂 The windows of Old Warehouse are broken, and will they fix them ? Thanks Martina 🙂 The windows almost definitely won’t be repaired, unless a company is willing to renovate the building (which would be brilliant!). Most likely, the building will eventually be pulled down, and houses put up on the land. LOL! 🙂 Do you ever take the pictures from smartphone? Lol! Smartphone is innovative. Do you ever try it ? 🙂 You can write a blog from the smartphone. I love that old warehouse shot, Andy. It looks like it’s taken a few beatings over the years! Thanks Lori 🙂 It certainly looks pretty well worn out. I’m guessing the corrugated piece on the end is only 50-60 years old, but they tend not to last much longer than that anyway. 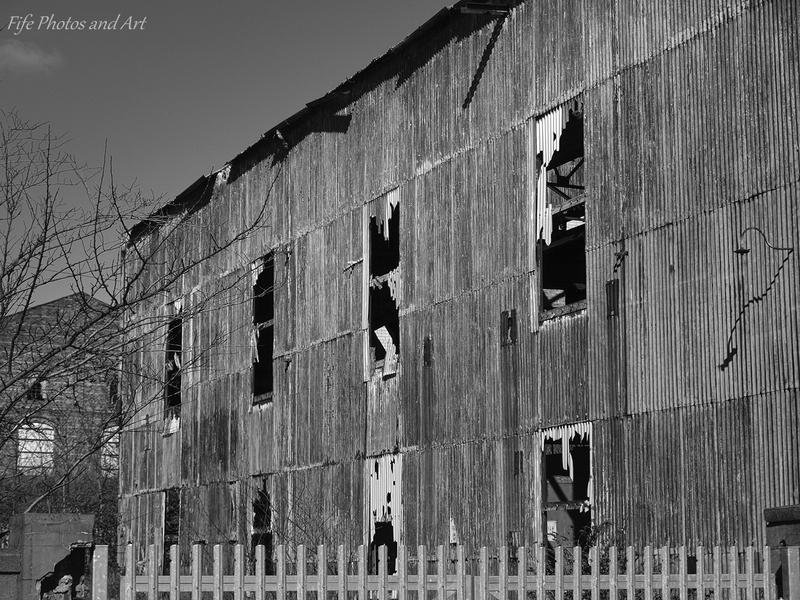 The rest of the building is no older than 120 years (its not shown on a map of the area from 1895), but I think it’s been derelict for at least the last 40 years or so, and hence looks pretty weather worn! Thank you Diana 🙂 It certainly is fairly unusual I think. Lovely choice of buildings, and I love the fire station especially – works so well in b&w! The Dunnikier Linoleum Works is a nice old building. I hope somebody does something with it rather than just letting it disappear. Amazing photos, love the firehouse! I love these building and the black and white! Thanks Lynz 🙂 They do certainly suit black and white photography. So many wonderful old buildings. Apart from the church and fire station, they’ve definitely seen better days! The old warehouse must be feeling very sorry for itself. All great in b/w again. I understand how you feel about that. It’s such a shame to see buildings of historic interest pulled down. Yes, you’re right.That way, at least the memory of the building will be preserved. I like the old warehouse shots best too though all the buildings are interesting. I’d be interested to see the inside of the church. Your images are amazing. Thanks sahring them. Black and White picture often look better. I don’t know what it is, but i look at pictures of Gastradamus in black and white, and i legitimately look better. Thanks for the likes, im fond to hear what you think about the new seaworld post that has gone up, when you get the chance, a comment would be excellent. I enjoyed your black and white walking tour of Pathhead. It looks like the kind of place I could be kept busy all day. Looks like I might just have to visit one day. I love the second one!!!! I like all of them but the second draws a special appeal to me.